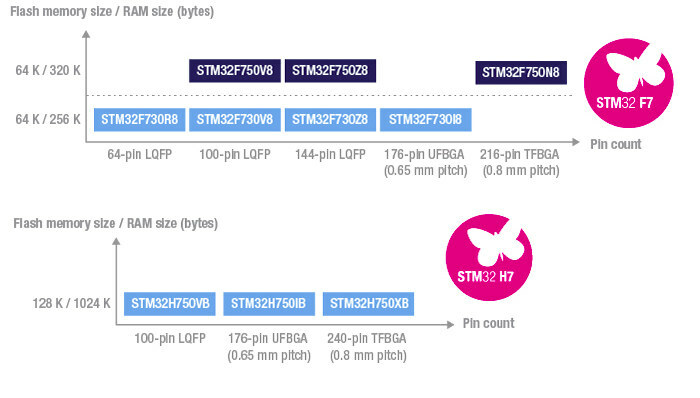 STMicro introduces their first Arm Cortex-M7 microcontrollers in 2014 with STM32F7 series clocked up to 200 MHz. The next year, Atmel – now Microchip – announced SAM S70 & SAM E70 Cortex-M7 MCU families clocked at up to 300 MHz, STMicro up the ante to 400 MHz with their STM32H7 family in 2016, and more recently NXP launched their i.MX RT series “crossover” processor with the Cortex-M7 reaching up to 600 MHz. AFAIK, nobody has tried to push the clock speeds higher, but STMicroelectronics must recently unveiled STM32F7x0 & H7x0 Value Line microcontrollers with the same performance level as their earlier STM32F7 and STM32H7 MCUs, but with a lower price by reducing the amount of internal flash. STM32F730 entry-level MCU @ 216MHz with 64KB flash, 8KB data / instructions cache, 256KB RAM and 16KB+64KB TCM (Tightly Coupled Memory). The microcontroller also includes cryptographic hardware acceleration, a USB 2.0 High Speed port with PHY, and a CAN interface. STM32F750 is similar to STM32F730, but adds a TFT-LCD controller with STMicro’s proprietary Chrom-ART Graphics Accelerator, as well as two CAN interfaces, an Ethernet MAC, a camera interface, and two USB 2.0 interfaces with Full Speed PHY. The amount of flash and TCM is the same, but the MCU comes with a bit more RAM, precisely 320KB SRAM. STM32H750 high-end MCU delivers 2020 CoreMark performance at 400MHz and comes with 128KB flash, 16KB D/I cache, 864 SRAM, 64KB+128KB TCM with ECC correction. It also adds a hardware JPEG coder/decoder, CANFD ports including one with time-trigger capability, as well as an operational amplifiers and 16-bit ADCs running at up to 3.6Msample/s. The available flash on those parts is said to still allow secure boot, sensitive code and real-time routines to run safely on-chip, and if you need extra storage you could connect external serial (QSPI) or parallel flash, or upgrade to the earlier pin-to-pin compatible STM32F7 or STM32H7 MCU lines with up to 2MB Flash and up to 1MB RAM. The STM32F730, STM32F750, and STM32H750 Value Line MCUs are available now in LQFP and BGA packages from 64-pin to 240-pin. Prices start at $1.64 for the STM32F730, $2.39 for the STM32F750 and $2.69 for the STM32H750 for 1000 units orders. More details can be found in the respective product pages here and there. Btw, Google Adsense is serving those ads. There may be an option to disable those (probably) not relevant ads, just not sure where. Are the mentioned prices for 1k or 10k. units ? The prices seems not so bad, but wondered if they would remain at this level. Lately those companies seems initially to offer low prices and later raise the prices. Also it is interesting what are the prices for singe quantities, since no samples are available for STM32H. The price for STM32H743 (small quantities) is above 20 USD. I see, you got them from the product announcement, but actually the product pages have higher prices and quotes for 10k units. You’re right. Now I can see. What’s the point of the price in their PR then? Probably just marketing to convince people to move to their products, but as much I have understanding of STM pricing, wouldn’t be surprised if those chips end near 10 USD for small quantities. initially for 7.99 USD, but the current price with 256M RAM – 4GB eMMC is 18 USD. For 25 USD PocketBeagle can be purchased and has much better software support etc. 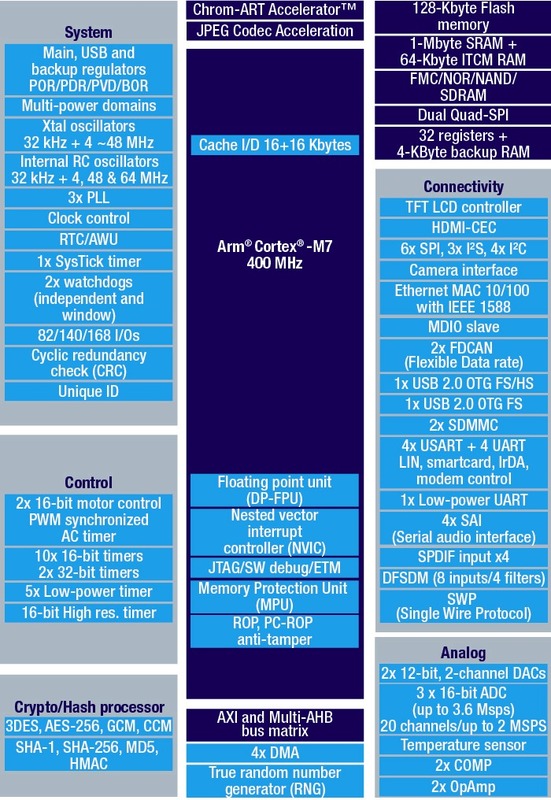 Finally they introduced High Speed embedded USB 2 controller (up to 480 Mbits), so far I’ve only seen Full Speed implementations on other MCUs. NXP has had some for a number of years. Also the MK66 line, as used by Teensy 3.5/3.6. XMOS chips have USB high speed accessible to some slices – obviously you’d have to learn their toolchain. The Texas Instruments TM4C series have some micros with high speed controllers, but full speed transceivers. If you don’t mind having an external PHY, these work just fine at high-speed, too. These are just the ones I’ve used – there’s sure to be a lot more.